The present study was conducted to investigate the effects of 24 g niacin (nicotinic acid (NA)) supplementation over 40 weeks with two forage-to-concentrate ratios (60% concentrate vs. 30% in the total diet) on performance variables of energy metabolism such as plasma concentrations of non-esterified fatty acids (NEFA), beta-hydroxybutyrate (BHB), glucose and nicotinamide (NAM), and the fatty acid profile in rumen fluid. In a 2 x 2 factorial design, 64 German Holstein cows were divided postpartum into four dietary groups: i) 60% concentrate supplemented with 24 g NA (Group 60 + NA); ii) 60% concentrate without NA (Group 60-); iii) 30% concentrate with 24 g NA (Group 30 + NA) and iv) 30% concentrate without NA (Group 30-). The experiment started on the day of calving and continued for 40 weeks. Niacin supplementation did not affect milk yield or composition. The plasma niacin content increased in the supplemented groups, especially Group 30 + NA. Niacin supplementation led to decreased plasma glucose concentrations. 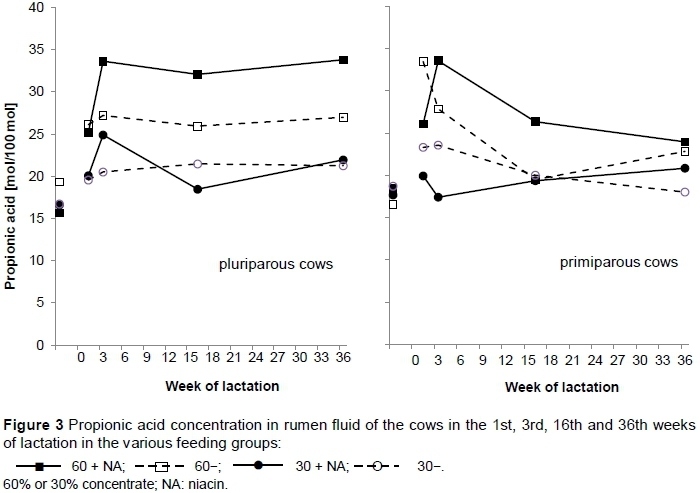 The interaction of concentrate x niacin enhanced the molar proportion of propionic acid in rumen fluid in Group 60 + NA. Total short-chain fatty acid (SCFA) concentrations were increased by level of concentrate, niacin supplementation and the interaction, concentrate x niacin. Plasma levels of NEFA and BHB remained unaffected. In sum, concentrate level, niacin supplementation and the interaction of concentrate x niacin increased plasma NAM concentration, whereas plasma glucose concentration was decreased by niacin supplementation. It is assumed that ruminants cover their niacin requirements through feed, endogenous synthesis from tryptophan and microbial synthesis by rumen microbes (German Society of Nutrition Physlology (GfE), 2001; NRC, 2001). Ruminal niacin synthesis occurs, as well as degradation. Several studies showed that ruminal synthesis might vary when different feeding regimens were applied. Feeding diets containing high levels of concentrate increased the ruminal niacin concentration (Hayes et al., 1966; Nilson et al., 1967; Girard, 1994). Santschi et al. (2005b) assumed that ruminal niacin supply depends on diet composition, and that there are indications that the metabolism of supplemental niacin is influenced. Although it was presumed that ruminal niacin synthesis is sufficient for dairy cows with average performance level (Girard, 1998; GfE, 2001), this is possibly not always the case (Flachowsky, 1993; Girard & Matte, 2005; Breves & Lebzien, 2009). Weiss & Ferreira (2006) suggested that the requirements of dairy cattle tend to exceed the capacity of rumen microorganisms to synthesize sufficient amounts of vitamins of the B complex, owing to the improvement in the genetic potential of cows for higher milk yield. Recent studies have revealed beneficial effects of niacin supplementation on performance (Cervantes et al., 1996; Drackley et al., 1998) and energy metabolism (Erickson et al., 1992; DiCostanzo et al., 1997). Drackley et al. (1992) reviewed 24 trials, which included 40 treatment comparisons with niacin supplementation, and, in most cases, found positive responses to supplemental niacin. Average responses to supplemented niacin resulted in increased milk production, but in most studies only early lactation was considered. Niacin supplementation decreased blood non-esterified fatty acid (NEFA) and beta-hydroxybutyrate (BHB) concentrations, while blood glucose concentration was increased in ketotic cows (Fronk et al., 1980). Pires & Grummer (2007) found decreased plasma NEFA concentration and ketone bodies due to supplemental nicotinic acid in feed-restricted cows. Previous findings revealed mainly positive effects of niacin supplementation, but results are contradictory. This may be because of conditions such as the type of niacin that is used (encapsulated or not) and its analysis, amount of niacin supplementation, age of cows, feeding regimen, time of sampling, different blood fractions and stage of lactation. In addition, there is a shortage of results from long-term experiments concerning high-dose niacin supplementation to primiparous and multiparous dairy cows. Feeding a diet with a high level of concentrate is common practice, especially at peak lactation, and aims at compensating for the energy deficit that typically occurs after calving. Such diets are known to alter the ruminal microbial communities and fermentative pattern, and might therefore affect the ruminal synthesis of niacin. Therefore, the aim of the investigation was to measure the effects of two levels of concentrate in the diet, in the presence or absence of supplemental niacin, on milking performance and selected rumen fluid and blood parameters. The study was conducted at the experimental station of the Institute of Animal Nutrition, Friedrich-Loeffler-Institute, Braunschweig, Germany, according to the German Animal Protection Act (Tierschutzgesetz) in the version officially published on 18 May 2006 and approved by the Lower Saxony State Office for Consumer Protection and Food Safety. Sixty-four German Holstein cows (38 multiparous, with lactation numbers ranging from second to fifth lactation and 26 primiparous) were assigned to one of four dietary treatments according to mean milk yield, number of lactation and bodyweight. The experimental diets contained high (60%) or low (30%) levels of concentrate, and were unsupplemented (60- vs. 30-) or supplemented with 24 g niacin/cow/day (60 + NA vs. 30 + NA) (Table 1). The niacin contained at least 99.5% nicotinic acid (Lonza Ltd., Basel, Switzerland), and was powdered and pelleted with the concentrate allowance per treatment. The rations were formulated according to the recommendations of the GfE (2001). The cows had free access to water. The study was performed from the day of calving to the 40th week of lactation. 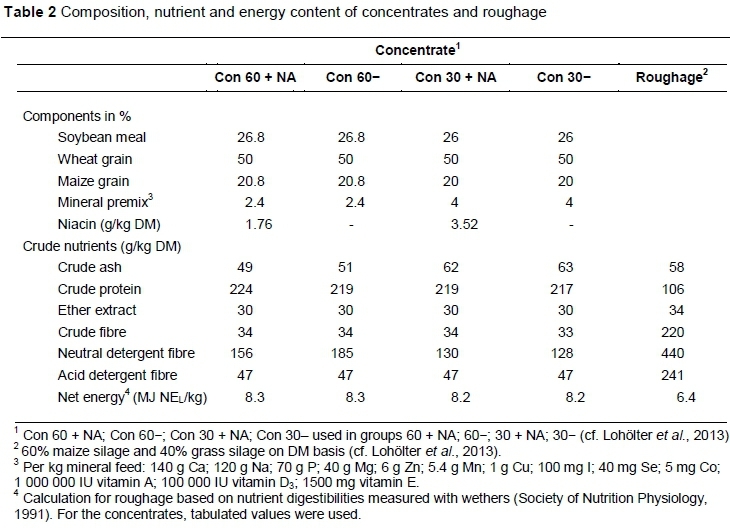 The compositions of concentrate and roughage are given in Table 2. The cows were housed in pens according to their feeding group, in a free-stall barn equipped with slatted floors and cubicles covered with rubber mattresses. The roughage was offered in self-feeding stations (Type MJ/ RIC, Insentec, B.V., Marknesse, The Netherlands), which were re-filled daily at approximately 10:00. Concentrate was provided via computerized feeding stations (Type MJ, Insentec, B.V., Marknesse, The Netherlands). All animals were equipped with ear transponders to record the daily animal individual feed intake. Feed was provided ad libitum, but to achieve the intended concentrate-to-roughage ratios in the various feeding groups, the amount of concentrate was adjusted twice weekly according to individual roughage intake. The experiment started individually for each cow on the day of calving. Representative concentrate samples were taken weekly, and maize and grass silage samples twice a week, and pooled over approximately four-week periods. The cows were milked at 5:30 and 15:30, and individual milk yields were recorded daily by automatic milk counters (Lemmer Fullwood GmbH, Lohmar, Germany). Samples for analysis of milk composition were taken twice a week, conserved with bronopol, and stored at 8 °C, prior to analysis. Bodyweight was recorded automatically when the animal left the milking parlour. Rumen fluid and blood samples were taken from nine cows from each feeding group (five primiparous and four multiparous cows). Samples were collected three weeks ante partum and 1, 3, 16 and 36 weeks postpartum. Rumen fluid samples were taken via oral rumen tubes. Approximately 100 mL of rumen fluid was collected from the ventral sac through the oral rumen tube with a hand vacuum pump. Fluid was collected at 8:00 after feed withdrawal of at least 2.5 h. After measuring the pH value, samples were centrifuged at 1680 x g for 5 minutes at 4 °C. Then 1 mL sulphuric acid (25%) was added to 10 mL supernatant and samples were centrifuged again. The supernatant was kept frozen at -20 °C for later measurement of the profile and concentration of volatile fatty acids. Blood was collected from the vena jugularis externa into heparin tubes (clinical chemistry) and monovettes (niacin analysis). Approximately one hour after sampling, plasma and serum were separated by centrifugation at 3000 x g for 30 minutes at 15 °C. Serum for niacin analysis was stored at -80 °C, and plasma for analysis of other blood parameters was kept at -18 °C. The composition of the feedstuffs was determined according to the methods of the Association of German Agricultural Analysis and Research Centres (VDLUFA, 2007). Crude ash (ash) was analysed by method 8.1, and crude fibre (CF) and ether extract (EE) were determined by methods 6.1.1 and 5.1.1, respectively. Crude protein (CP) was analysed using the Dumas combustion method (method 4.1.2). Neutral detergent fibre (NDF) was determined as described by Van Soest et al. (1991) and acid detergent fibre (ADF) analysis according to method 6.5.2 of VDLUFA (2007). Both levels were expressed without residual ash. The niacin concentration in feedstuff was determined microbiologically using Lactobacillus plantarum as an indicator strain (VDLUFA method). Milk samples were analysed for fat, protein and lactose concentrations, using an infrared milk analyser (Milkoscan FT 6000, combined with a Fossomatic 5000, Foss Electric, Hiller0d, Denmark). The pH of rumen fluid was measured immediately after collection (pH525, WTW, Weilheim, Germany). SCFA were analysed with a gas chromatograph (Hewlett Packard 5580, Avondale, Phil., USA), equipped with a flame ionization detector as described by Geissler et al. (1976). Plasma was analysed for glucose, NEFA and BHB concentrations, and glucose analysis was performed with the hexokinase assay (ABX, Art. A11A22116). NEFA concentrations were determined via an enzymatic colour test (Art. 99475409, Wako Chemicals GmbH, Neuss, Germany). An enzymatic UV test was applied to measure concentrations of BHB (Art. RB 1008, Randox Laboratories GmbH, Krefeld). Niacin concentration in plasma was determined with high performance liquid chromatography (HPLC), as described by Niehoff et al. (2009b). Energy intake was calculated by multiplying the daily dry matter intake (DMI) with the energy concentration of the whole ration. Daily feed intake, live weight and milk constituents were pooled to obtain weekly means before data analysis. Statistical analysis of performance parameters was generally based on the individual weekly mean. Statistical analysis was carried out using the software package SAS version 9.1 (SAS, 2008). All parameters were analysed as repeated measures, using the MIXED procedure. 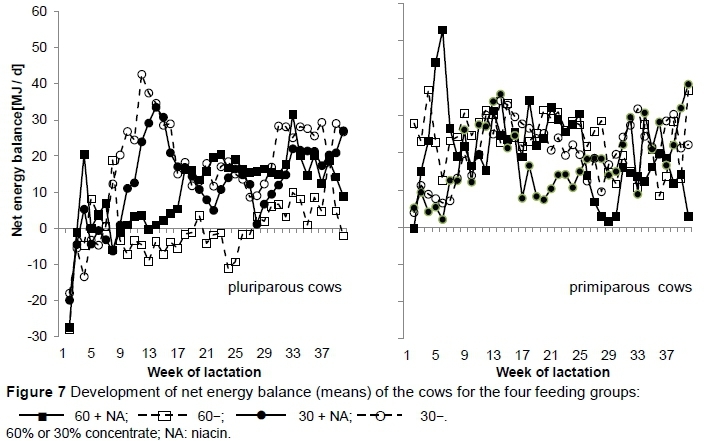 In the model, dietary concentrate proportion, niacin supplementation, parity, week of lactation and their interactions were regarded as fixed effects, while the individual cow was handled as a random variable. For all analyses, significance was declared when P-values were <0.05, and a tendency was noted when 0.05< P <0.10. From the initial pool of 64 cows, 60 completed the whole experimental period of 40 weeks. In the beginning, two cows were replaced after dystocia (Groups 60- and 30 + NA). During the trial, the replacement cow in Group 60- was exchanged again because of dystocia. The replacement cow in Group 30 + NA finished the 16th week of lactation, and was then removed owing to sickness (lameness, week 31.) Consequently, the data were lost from one animal in the third week ante partum (Group 60-) and one in the 36th week of lactation (Group 30 + NA). Table 3 shows the effects of concentrate level and niacin supplementation on DMI and milk production. Table 4 depicts the fatty acid profile of rumen fluid and blood parameters. The intake of concentrate and roughage largely met the intended proportions in the various feeding groups. The animals received the expected concentrate and roughage ratio: Group 60 + NA: 59 ± 3% vs. 41 ± 8%; Group 60-: 56 ± 7% vs. 44 ± 7%; Group 30 + NA: 29 ± 7% vs. 71 ± 5%; Group 30-: 30 ± 2% vs. 70 ± 5%. The daily NA supplementation of 24 g/cow was slightly lower than intended: Group 60 + NA obtained 21.0 ± 0.3 g total niacin/cow/day, while Group 30 + NA received 20.5 ± 0.2 g. The niacin intake of Group 60- amounted to 2.8 ± 0.03 g, and Group 30- consumed 1.0 ± 0.0 g daily. Changes in DMI for pluriparous cows and primiparous cows over the 40 weeks are shown in Figure 1. In early lactation (until week 8) the groups fed 60% concentrate had a higher increase of DMI, and Group 60 + NA had a steeper increase compared with Group 60-, resulting in DMI that was 0.85 kg/d higher (weeks 4 - 8) than in Group 60-. However, in almost the entire lactation period - and present mainly in the multiparous cows - Group 60 + NA showed a higher DMI than Group 60-. This did not occur in the combination of low concentrate with supplemental niacin, where the result was reversed. 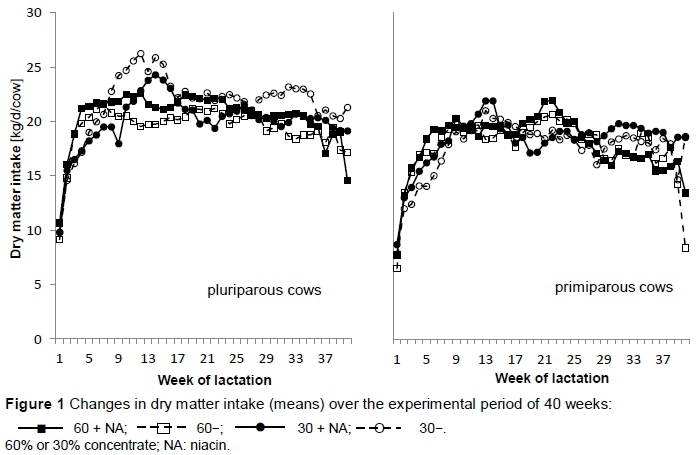 The cows from Group 30 + NA showed lower DMI than Group 30- from the fifth week of lactation, while most of the time the primiparous cows of Group 30 + NA exhibited a higher DMI (Figure 1). Concentrate level influenced almost all of the parameters, except milk fat yield and milk lactose percentage. Feeding high levels of concentrate increased milk yield (P = 0.001) and FCM yield (P = 0.011), but these parameters were not affected by niacin supplementation. 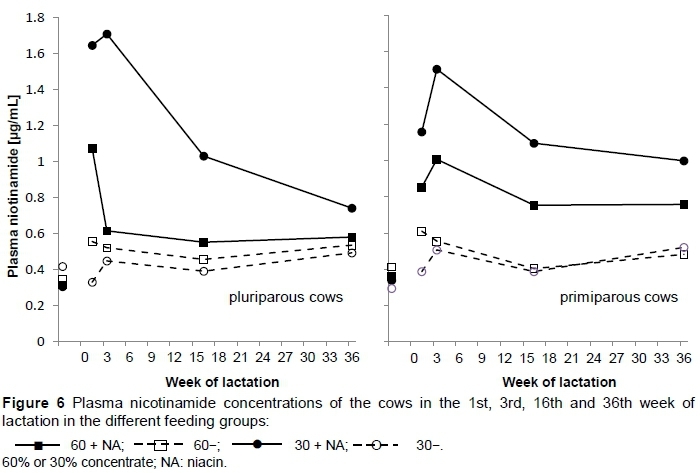 In terms of the primiparous cows receiving niacin, there was increased milk yield, especially in early lactation compared with the unsupplemented primiparous cows. Because such effects were not observed in pluriparous cows, interactions between niacin and parity for milk (P = 0.042) and FCM yield (P = 0.001) might be explained. The milk and FCM yield were increased over the entire lactation period, resulting in 6.0 kg/d more yield and 2.3 kg/d more FCM, respectively, in primiparous cows in the 60% concentrate groups and 2.4 kg/d yield and 3.2 kg/d FCM, respectively, in the groups receiving 30% concentrate (Figure 2). Milk fat percentage decreased at high levels of concentrate (P <0.001). Milk protein percentage and milk protein yield were increased by high levels of concentrate (p <0.001). Milk lactose percentage tended (P = 0.061) to be increased with level of concentrate. Milk lactose yield was elevated (P <0.001) by level of concentrate. These four parameters were not influenced by niacin supplementation. The fat-to-protein quotient (F-P-Q) was decreased (P <0.001) by high concentrate levels (60%), and there was an interaction between concentrate and niacin (P = 0.002). In rumen fluid, the molar proportions of the volatile fatty acids over the four sampling times are shown in Figure 3. The groups kept on 60% concentrate, namely Groups 60 + NA and 60-, revealed lower molar proportions of acetic acid (P <0.001) and higher proportions of propionic acid (P <0.001) and valeric acid (P <0.001). The groups receiving 30% concentrate revealed a higher molar proportion of acetic acid and lower proportions of propionic and valeric acid. In addition, the molar proportion of propionic acid was influenced by an interaction between concentrate and niacin (P = 0.031). The group receiving 60% concentrate with supplemental niacin had a higher molar proportion of propionic acid in rumen fluid than Group 60-. The only exception was in the first week of lactation. At this time point the molar proportion of propionic acid was higher for Group 60- compared to Group 60+ NA (Figure 3. Total ruminal SCFA concentration was increased by the level of concentrate (P = 0.001), as well as niacin supplementation (P <0.001) (Figure 4). Niacin supplementation decreased (P = 0.014) plasma glucose concentration, and there was a tendency for interaction between niacin and concentrate proportion (P = 0.062) (Figure 5). The plasma glucose concentration ranged from 3.4 mmol/L in Group 60 + NA in the 1st week of lactation to 4.0 mmol/L in Group 30- in the 16th week of lactation. BHB and NEFA concentrations (Figure 8) were unaffected by niacin supplementation. Only concentrate level influenced plasma BHB concentration (P <0.001). Low concentrate proportion led to higher plasma BHB concentrations and vice versa. Plasma NAM (Figure 6) was generally higher (P <0.001) in cows fed niacin-supplemented diets. 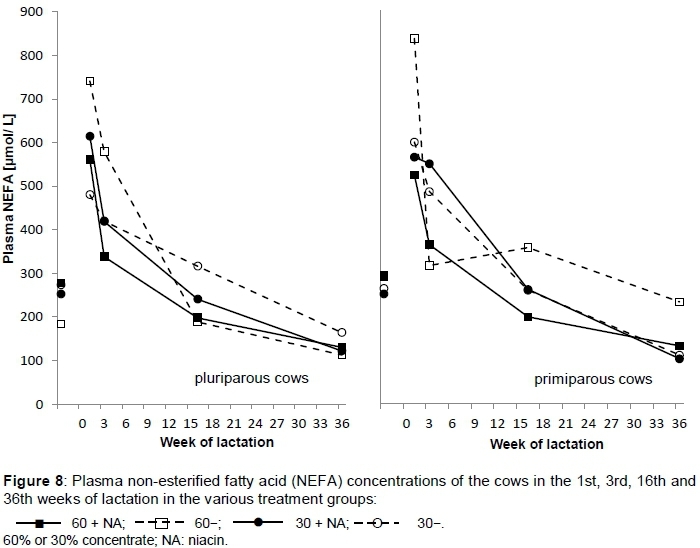 However, the elevation in plasma NAM level was even more pronounced when the cows were fed the diet with the low concentrate level (Group 30 + NA) and caused significant interactions between concentrate proportion and niacin supplementation (P <0.001). Plasma NAM values were minimal; 0.36 μg/mL in Group 30- in the first week of lactation, and maximal 1.62 μg/mL in Group 30 + NA in the third week of lactation. 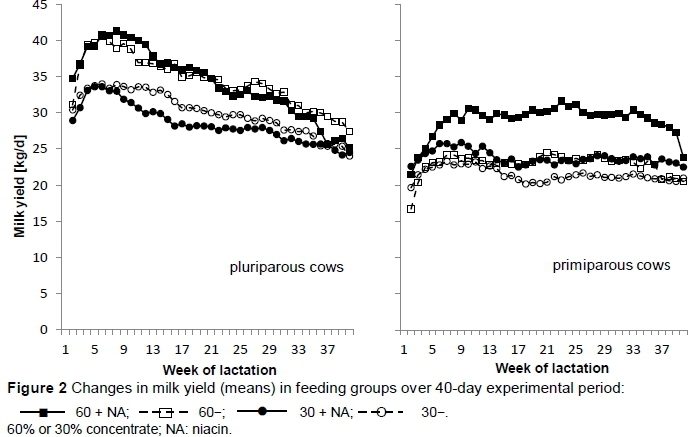 In short-term studies, the effects of dietary supplementation of niacin on performance and metabolic parameters of dairy cows have been well investigated in the transition period, during early lactation, and for a few weeks in mid lactation. However, there is a dearth of studies of the long-term effects on dairy cows of high doses of niacin supplementation with different concentrate proportions. It was found that concentrate level (18% - 60%) with a low level of niacin supplementation (6 - 12 g/d/cow) in the diet influences the fate of supplemental niacin and the rate of ruminal niacin production or degradation, and therefore the mode of action of niacin supplementation (Niehoff et al., 2009a). Thus, the aim of the present study was to investigate the effects of high doses of niacin supplementation with two concentrate levels over an entire lactation period. Concentrate levels had a great influence on many of the parameters (Tables 3 and 4). However, many of these effects were found in or caused by the primiparous cows. These effects were responsible for the detected significant interactions. In agreement with Jaster & Ward (1990), Martinez et al. (1991) and Erickson et al. (1992), DMI was not affected by supplemental niacin. In Groups 60 + NA and 60-, in early lactation (up to the seventh week) DMI increased faster than in Groups 30 + NA and 30-. In early lactation (up to 4 - 8 weeks), the DMI of Group 60 + NA increased. Over the course of the trial, and from week 8 of lactation in particular, the cows compensated for the low concentrate level with higher DMI and consequently their energy balance was increased (Figure 7), which was partially caused by a lower performance level. In the present study, 24 g niacin supplementation per day per cow did not lead to a significant difference in milk yield. These results are similar to those of studies by DiCostanzo et al. (1997), which investigated the effects of 12 g, 24 g and 36 g supplemental niacin in cows (90 d of lactation) over three consecutive 17-d periods. This matches numerous investigations performed earlier with lower levels of niacin (Erickson et al., 1990; Martinez et al., 1991 and Christensen et al., 1996). However, when only the primiparous cows that received niacin were considered, increased milk yield could be found in early lactation, which agrees with other studies (Jaster & Ward, 1990; Young & Smith, 1994). Moreover, over the entire lactation period, niacin-supplemented primiparous cows showed enhanced milk production compared with unsupplemented primiparous cows. It is suggested that enhanced production of microbial protein might explain the increase in milk production when feeding nicotinic acid (Riddell et al., 1981). Holter et al. (1983) suspected that niacin supplementation affected the secretion of milk fat negatively via depressed fat mobilization. These authors assumed that enhanced production of microbial protein might explain increases in milk production. But the primiparous cows in the trial were minimally conditioned at calving (score 2 on a scale of 5 = fat to 1 = thin) when feeding NA. However, the data were evaluated for primiparous and pluriparous animals over the entire lactation period. In this period, the metabolic situation varied. In addition, taking cows and heifers together, the animals were in a less pronounced negative energy balance, so no effect was found on milk yield or FCM yield. This is in agreement with Niehoff et al. (2009a), who concluded that the absence of a niacin effect could be explained because the cows were too far into lactation, and thus not in a negative energy balance (Ottou et al., 1995), as in the present trial when cows and heifers were evaluated together. If they were considered separately, it could be seen that the cows had entered a negative balance (Figure 7), owing to their higher milk performance. In contrast, Cervantes et al. (1996) found increased milk yield due to niacin supplementation in mid-lactation when cows were probably not in a negative energy balance. Drackley et al. (1998) evaluated the effect of 12 g niacin supplementation per day over 40 lactation weeks, and found that milk production and FCM increased. Similarly, Schwab et al. (2005) demonstrated increased milk yield and FCM in a meta-analysis. In agreement with Driver et al. (1990), Jaster & Ward (1990) and Christensen et al. (1992) who used quantities between 6 g/d and 12 g/d supplemental niacin, no effect was detected on milk fat content for niacin supplementation. In the present study niacin had no effect on milk fat content. In most studies reviewed by Niehoff et al. (2009a), no effect was found for milk fat yield or milk protein content or yield. Differing from this, Belibasakis & Tsirgogianni (1996) found increased fat concentration and yield due to niacin (10 g/d); Erickson et al. (1992) found milk protein concentration increased (12 g NA/d); while Drackley et al. (1998) found it decreased (12 g/d). Lactose concentration and yield were unaffected, similar to the results of Christensen et al. (1992), Bernard et al. (1995), Ottou et al. (1995) and Minor et al. (1998), in which 6 g/d to 12 g/d niacin were supplemented. Thus, 24 g supplemental niacin did not affect milk components, similar to the results of Morey et al. (2011), in which 24 g/d/cow were applied, divided into two daily portions of encapsulated niacin. Reasons for differing results possibly include stage of lactation, quantity of niacin supplementation, feeding regimen, and time segment. In most earlier studies significant effects could not be detected on blood glucose concentration due to niacin (Martinez et al., 1991; Erickson et al., 1992 and Lanham et al., 1992). Only a few studies recorded increased glucose concentration (Ghorbani et al., 2008; Karkoodi & Tamizrad, 2009). In contrast, in the present trial the researchers found significantly lower plasma glucose concentrations in cows that were receiving supplemental niacin compared with those on the unsupplemented diets. Also Morey et al. (2011) found lower plasma glucose concentrations in niacin-supplemented cows, but only pre-partum and only in pluriparous cows. Morey et al. (2011) found a parity effect pre-partum and a trend postpartum due to 24 g supplemental encapsulated niacin, while the present study detected a parity effect postpartum. Pluriparous cows developed significant lower plasma glucose concentrations than primiparous cows. It is possible that the lower glucose concentration in niacin-supplemented pluriparous cows was due to a niacin-mediated increased sensitivity to insulin (Pires et al., 2007). Although in comparison with the reference range for glucose (3.0 - 3.3 mmol/L) the glucose values in the present study were already high, the niacin-supplemented Groups 60 + NA and 30 + NA revealed a slight but significant lower plasma glucose concentration compared with the unsupplemented groups, namely Groups 60- and 30-. Glucose concentration in blood is regulated by a large number of factors. After feed intake, the SCFA concentrations in blood increase and most glucose is supplied by gluconeogenesis from propionate acid in the liver. In the present study, Groups 60 + NA and 60-had high propionic acid concentrations in rumen fluid owing to the high concentrate proportion and therefore higher plasma glucose concentration. However, Groups 30 + NA and 30- revealed high plasma glucose concentrations too. Overall, these high glucose concentrations may be justified by time after feed intake, when samples were drawn. Moreover, the primiparous cows in particular revealed higher glucose values, and therefore the overall result in plasma glucose concentration (Figure 5). Niacin-supplemented heifers developed higher blood glucose concentration mid lactation (week 16), but this was masked by the evaluation of all animals, because the plasma glucose concentration of the cows showed the opposite. 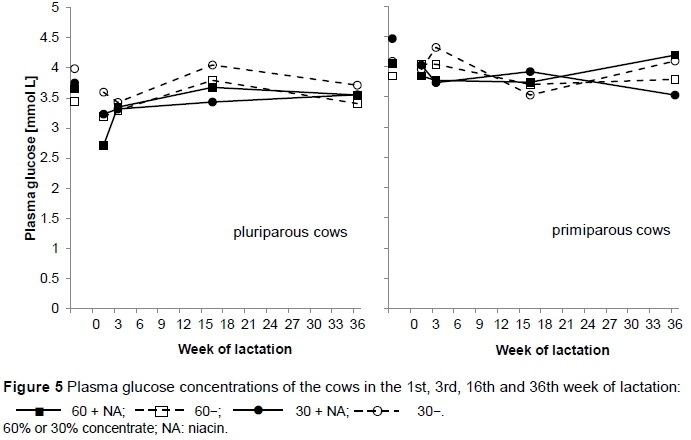 It is noticeable that in week 1 of lactation in particular the cows of Group 60 + NA developed the lowest glucose values, which is reflected in the molar proportion of propionic acid in Figure 3 and the total SCFA concentration of week 1 of lactation in Figure 4. Furthermore, Oba & Allen (2003) found that increased secretion of insulin because of enhanced concentration of SCFAs, especially propionate, seemed to be responsible for the decrease in blood glucose levels. That may explain the lower glucose concentrations in Group 60 + NA. This group had the highest molar proportion of propionic acid, which could have resulted in higher insulin secretion. Hence lower plasma glucose concentrations in Group 60 + NA might be due to an increase in insulin secretion because of a higher propionate supply from the rumen. However, this would not match the results of Group 30 + NA, which revealed slightly lower glucose concentrations, but did not have a higher concentration of propionic acid in the rumen fluid. Another possible explanation is that niacin might increase plasma insulin (Horner et al., 1986) and therefore lower glucose content in Groups 60 + NA and 30 + NA. Pires & Grummer (2007) achieved enhanced glucose clearance when plasma NEFA concentration was reduced by nicotinic acid, but the animals in their trial were fed restrictively. The animals in the present trial had no reduced NEFA due to nicotinic acid. Therefore, the lower glucose concentrations cannot be explained by increased glucose clearance. However, the direct effects of niacin on plasma glucose, such as stimulating glucose utilization in peripheral tissues and suppressing glucose production by the liver, are not known (Morey et al., 2011). No effect was observed on plasma NEFA or BHB concentrations owing to niacin supplementation. This is in agreement with studies by Chilliard & Ottou (1995), Cervantes et al. (1996) and Christensen et al. (1996). There was only decreasing BHB concentration owing to the high concentrate level. Animals were too far into lactation and not under sufficient metabolic stress to show effects. However, if cows and heifers were considered separately in week 1 of lactation, the niacin-supplemented cows and heifers of Group 60 + NA had lower NEFA concentrations than Group 60-(Figure 8). Martinez et al., 1991 detected increases in NEFA concentration, but in their trial fat was also supplemented. Decreases in NEFA were also observed by Pires & Grummer (2007) and Pires et al. (2007), but in feed-restricted, non-lactating, non-gestating cows. In addition, different niacin amounts were infused abomasally, which suppressed lipolysis and therefore lowered NEFA concentration. Moreover, in humans NAM is a weak agonist to the receptor (HM74A), which exerts an antilipolytic action after stimulation with NA (Wise et al., 2003). Niehoff et al. (2009a) noted that there is disagreement about the existence of NA in blood. Supplemented niacin is rapidly converted to NAD and then hydrolysed to NAM. It was concluded that NAM is the main transport form of niacin in blood (Henderson, 1983). In addition, Santschi et al. (2005b) estimated that only 5% of supplemental nicotinic acid is bioavailable. Morey et al. (2011) suggested most supplemented NA is converted to NAM after absorption. In the present study, only NAM could be found in plasma, supporting the assumption that supplemental niacin was converted to NAM, which might be the reason that NEFA did not decrease because of NA, which has a high affinity with the receptor (HM74A). In the present trial, NA was below detection limit. High blood NAM concentrations are usually the result of a high level of concentrate in the diet combined with niacin (Niehoff et al., 2009b), but in the present study the highest NAM plasma concentration was found in Group 30 + NA. In agreement with Driver et al. (1990), Ottou et al. (1995) and Cervantes et al. (1996), an increase was found in plasma NAM concentration after niacin supplementation. The trial started (third week ante-partum) with basal plasma NAM concentrations of nearly 0.35 μg/mL in all feeding groups. Increased plasma NAM levels may result from supplemental niacin in the diet or from increased intake of fermentable organic matter, which stimulates production by ruminal microbes (Morey et al., 2011). Furthermore, higher niacin degradation in Group 60 + NA than in Group 30 + NA might have occurred owing to the high level of concentrate, which might negatively influence the ruminal environment, and thus rumen microbes, and accordingly decreases in ruminal production. Niehoff et al. (2013) indicated that degradation in the rumen or absorption before the duodenal cannula may take place. The mechanism that leads to the disappearance of supplemental niacin is not known. Moreover, Niehoff et al. (2013) concluded that synthesis of niacin is lower in rations containing a high proportion of forage, so the high plasma niacin content of Group 30 + NA in the present study is probably because of the supplemental niacin. There is lack of understanding of the effects of feeding on niacin degradation and synthesis. However, there was an increase in vitamin production when microbial growth was enhanced, and the degradation of supplemental niacin seemed to be reduced simultaneously, but microbial growth was not measured. Mechanisms such as degradation and degradation by microflora that is greater than synthesis are not known (Niehoff et al., 2009a). In addition, niacin synthesis did not seem to occur if NA or NAM was supplemented (Hannah & Stern, 1985; Niehoff et al., 2013). Santschi et al. (2005a) stated that diets with higher amounts of concentrate affected ruminal vitamin synthesis, and substantial losses occurred. This is perhaps a reason for the lower plasma NAM concentrations in Group 60 + NA. Degradation by ruminal microflora greater than synthesis was also found by Schwab et al. (2006). Therefore, the lower concentrate proportion may lead to alterations in microbial composition, and therefore greater vitamin synthesis or less degradation could occur. The addition of 24 g niacin to the various concentrate levels resulted in decreased plasma glucose concentration and increased plasma niacin concentration, but DMI, milk performance, rumen fluid composition and plasma levels of NEFA and BHB remained unaffected. The considerable variation between multiparous and primiparous cows must be taken into account. Primiparous cows responded more sensitively to niacin supplementation. 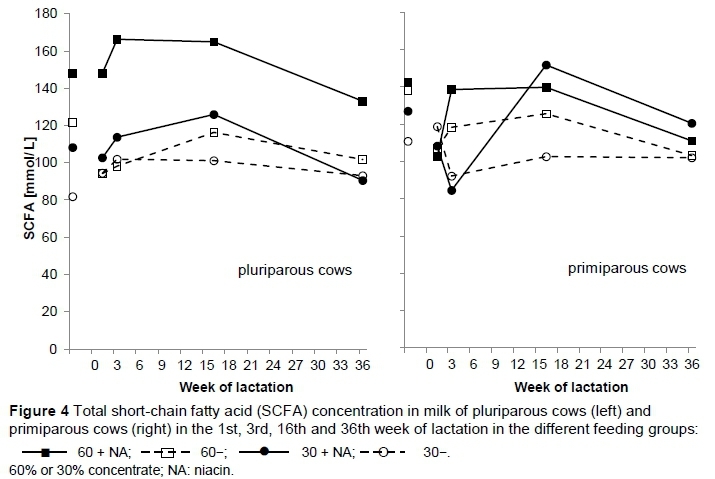 Niacin supplementation over the entire lactation period positively affected the milk yield of primiparous cows, total SCFA concentration, and the molar proportion of propionic acid in rumen fluid of all supplemented cows. However, the high level of concentrate must be considered, since feeding these levels supports the development of acidosis. Plasma NAM concentration was enhanced by supplemental niacin. Group 30 + NA showed the highest values. Therefore, further research is necessary to obtain more information about factors that influence niacin synthesis, degradation and absorption. In addition, the decreased plasma glucose content due to niacin supplementation needs further examination. The assistance of the co-workers of the Institute of Animal Nutrition and the Experimental Station of the Institute of Animal Nutrition, Braunschweig, Germany, in performing the experiment and analyses is gratefully acknowledged.